Everything You Want To Know About Surgical Technology! Becoming a surgical tech or thinking about surgical tech school is a big decision. If you are not prepared for a career in surgery, chances are it will be "just another dreadful -gotta pay the bills- job". BUT, if you want answers about becoming a surgical tech, I've created the SurgicalTechSuccess.com website -which is packed with information about the Surgical Tech. I also authored the best selling Surgical Tech Success Handbook, the Surgical Tech Success Quick Link Resource Library, and the Surgical tech's "Little Black Book". Listen, I'm not just trying to sell you a book. I became a Surgical Tech in the 1980's. I've traveled from coast to coast, trained in some of the largest hospitals and Trauma Centers in this country, and spent 10 years in the U.S. Air Force, (which, by the way, is where I was trained in Surgical Technology). I've made over $100,000.00 in a single year thanks to becoming a surgical tech. I will tell you how a surgical tech can become a top earner. If you’re thinking about a career in surgery, are a student or recent graduate of a Surgical Tech program, or a practicing Surgical Tech and want to give your career a boost, this is the premier “how to” Surgical Tech Package. Want help choosing a school or program? Listen, section 5 of the Surgical Tech Success Handbook can literally save you thousands of dollars and prevent you from wasting months and possibly years in the wrong school or program. 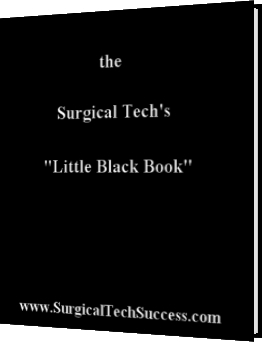 the Surgical Tech's "Little Black Book"
continue down the page, click here. In the Surgical Tech Success Quick Link Resource Library, you will find over 100 links directly related to helping enhance your career in Surgical Technology. Inside the Surgical Tech's “Little Black Book” a technique is revealed that will enable you to remember each case and surgical procedure step by step. This technique is used by the top surgical technologists in the country. Surgical Tech Instructors and Operating Room Educators have recommended this technique to help their students get through clinicals and operating room orientation. Don’t be surprised by the overall simplicity of this technique. So, what’s this “Little Black Book” all about? It’s the insider’s technique that will help you get through every case like a surgical champion. By using this technique, you will start memorizing things about procedures, surgeons, and their preferences quicker than you could possibly imagine. Whether you’re a Surgical Tech Student, New Graduate, Instructor, experienced scrub, or just thinking about a career as a surgical technologist, Surgical Tech Success is your number one resource. As a Military trained Surgical Technologist, with over 20 years in the medical field, founder of SurgicalTechSucces.com, and seasoned veteran in the world of surgery, Mr. Prince has put together a complete handbook and “how to guide” dedicated to the Success of the Surgical Tech to include potential students, current students, new grads, and experienced Surgical Techs. After reading this handbook you will be educated about the “real world” facts of the operating room, the Surgical Tech, the surgeon, the O.R. nurse, and other surgically related professionals. You will understand the attitudes and how they are developed. You will see how to take your training as a surgical technologist and use it to promote and enhance your career. You will understand that a feeling of being OVERWHELMED is completely normal. You will be introduced to related careers where Surgical Tech training may be a key factor. You will understand whether or not you should specialize. You will learn how to develop a sense of calmness, inner strength, and self-motivation. You will discover the truth about a career in surgery! Surgical Technology can open many doors to some of the most incredible career opportunities in and around the health care field IF you know how to produce and engineer your career. You can make big money as a Surgical Tech! You should never have a problem finding employment. Surgical Tech's have excellent career opportunities in & around surgery. Surgical Tech Success will help you succeed! The Surgical Tech Success Handbook will walk you through the world of the surgical tech and teach you things you didn’t learn before you enrolled in a surgical tech program or in the classroom. It will take you from potential student to student to new graduate to employment to career advancement. "I have been in the trenches as a surgical tech living from check to check and I have also been in the $"big bucks"$ living on the ocean in Redondo Beach, California as a surgical tech and not paying a dime for rent!" While students, potential students, and new graduates will find this guide to be an insightful look at how to engineer a career as a surgical tech, the experienced technologist will find valuable information about career advancement and the nationwide opportunities. Surgical Tech Success Quick Link Resource Library. FREE access to Live Surgeries on the internet! FREE access to a host of on-line Surgical Videos! 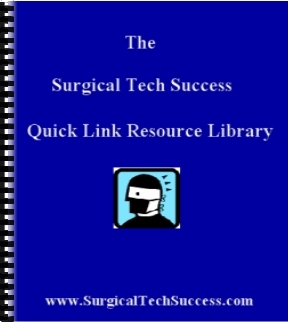 The Surgical Tech Success Quick Link Resource Library would normally sell for $49. IT'S YOURS FREE! The "Little Black Book" will prove to be one of your biggest resources! This book covers a technique that will enable you to remember each case and surgical procedure, step by step. This technique is used by the top surgical techs in the country. Surgical Tech Instructors have recommended this technique to help their students get through clinicals. This FREE BONUS would normally sell for $37. Again, it's yours FREE! Like I said earlier, the Surgical Tech Success Handbook is a survival guide for anyone interested in becoming a Surgical Tech! am very pleased to find a tool this helpful and concise! or are considering, this career path. who are just getting into this field. You have provided me with answers to a lot of questions. I was at my old job and having weekends off and better hours. or to help you gain an advantage in the job you are already working. and I have no doubt that others will be as thrilled as I am. it helped me to find success as a surgical tech. Overall, I really like this concept! a student or recent graduate can use. got a part-time job working in a hospital. There are a lot of people who could use your handbook. explain what it is a surgical technologist does. It is simply too big for a short phone call. I commend you for taking the time to put this together. of this prospective career move. an easy to reference handbook. I have been a Surg. Tech for 25 years and appreciate your efforts. This really is an incredible resource. I wish it would have been available before I started my surgical career. You really put a lot of useful information into your work. If you’re thinking about a career in surgery, are a student or recent graduate of a Surgical Tech program, or a practicing Surgical Tech and want to give your career a boost, this is the “how to” handbook written for all levels of Surgical Techs everywhere. is valued well over $100!